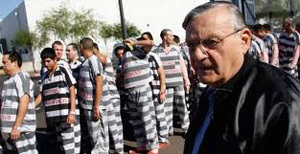 PHOENIX (AP) - Outspoken Arizona Sheriff Joe Arpaio is opposing the appointment of an independent monitor and other moves to address a judge's finding that his agency racially profiled Latinos, according to a court filing on Friday. The move could result in a judge ordering the Maricopa County Sheriff's Office to comply with constitutional requirements that ban the practice. In May, U.S. District Judge Murray Snow found that Arpaio's office singled out Latinos, and that deputies unreasonably prolonged detentions, marking the first finding by a court that the agency engages in racial profiling. Arpaio's office is appealing. Judge Snow delayed issuing orders in the case in June after both parties indicated they wanted time to work toward an agreement. The joint filing on Friday indicated the judge would have to provide more guidance during an Aug. 30 status conference given the lack of agreement on a proposed consent decree. In the filing, the parties indicated they have "engaged in good faith discussions" and were able to reach agreement on some terms but remained at odds over several major points, including having a court-appointed monitor oversee the department's compliance with the court's ruling. Snow's May ruling came after a small group of Latinos sued the Sheriff's Office for violating their constitutional rights. The sheriff rejected a similar proposal last year when the U.S. Justice Department leveled racial profiling allegations against the agency. Arpaio says allowing a monitor means every policy decision would have to be cleared through an observer and would nullify his authority. "If the court were to appoint a monitor, the role and authority of such monitor must be reconciled so that the monitor's role does not supplant the elected sheriff's authority under the Arizona Constitution and Arizona statute," lawyers wrote in the latest filing. However, during the June hearing, Judge Snow made it clear that he planned to assign a federal monitor who would have significant authority to oversee retraining of deputies, among other changes at the office. Arpaio's office also opposes the plaintiffs' proposal to create an advisory board aimed at improving the department's relationship with the Latino community, as well as an effort it said would force deputies to "subjectively guess as to the race of a driver or passenger." Maricopa County Supervisor Mary Rose Wilcox said she wasn't surprised by the sheriff's reluctance to agree to key terms but added, "the remedies are coming, like it or not. "Without a monitor, who can trust the agreements are being met?" she asked. Judge Snow's ruling doesn't altogether bar Arpaio, 81, from enforcing the state's immigration laws, but it does impose a long list of restrictions on the patrols. They include prohibitions on using race as a factor in deciding whether to stop a vehicle with a Latino occupant and on detaining Latino passengers only on the suspicion that they're in the country illegally. The case that led to Snow's ruling focused on Latinos who were stopped during both routine traffic patrols and special immigration patrols known as sweeps. During the sweeps, deputies flood an area of a city - in some cases, heavily Latino areas - over several days to seek out traffic violators and arrest other offenders. Immigrants who were in the country illegally accounted for 57 percent of the 1,500 people arrested in the 20 sweeps conducted by Arpaio's office since January 2008. The federal Justice Department filed a lawsuit last year that also alleges racial profiling in Arpaio's immigration patrols. The federal government's suit, however, claims broader civil rights violations, such as allegations that Arpaio's office retaliates against its critics and punishes Latino jail inmates with limited English skills for speaking Spanish. Arpaio has denied the claims.